Here is my dissection of my little Asus Eee PC 1005HA netbook. First and foremost, ASUS was the 1st company to introduce the “NETBOOK” line which is totally awesome. The 1005HA is one of the most popular member of the expanding ASUS Eee PC lineup, and while its specs is comparable to the 1008HA, the removable battery makes a lot of difference. 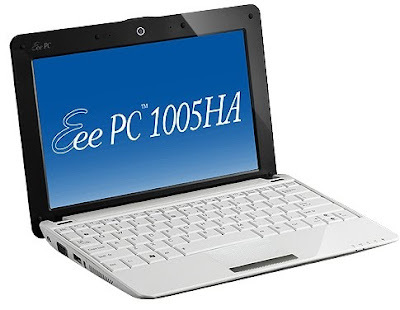 In many of the same ways just like the Asus Eee PC 1000HE was a slightly revamped version of the 1000H, the 1005HA is just a mildly tweaked version of 1008HA. It has the following bundled software with just an application to access Eee Storage (10GB is available free of charge for a year and for a fee afterwards), Adobe Reader 8, a 30 day Microsoft Office trial, Skype, Microsoft Works and a Norton Security or trend micro Anti Virus Trial included. What I like is that, Asus also includes its Super Hybrid Engine, which is an application that sits in the System Tray and enables users to easily switch from one power profile to another based on current usage scenarios. Although I would prefer some stylish aesthetics externally rather than the super glossy finger print prone exterior. For me, overall it’s a balance of great specs. You can’t have everything though so I you want to go for pure usage reliability go for another brand but if you don’t want to get caught using something in public that isn’t too fancy for the eye look for another netbook brand. But for me this little machine is small but packs a punch and not too bad for the eyes.